The media coverage of the events unfolding in Venezuela provides a troubling example of how the imperial ambitions of the United States can magnify crises—especially when contrasted with the current political situation in Haiti. Both Venezuela and Haiti have been facing anti-government protests, with the respective oppositions citing poor leadership, corruption, electoral fraud, and a deteriorating economy as their primary motivations in calling for change. However, the international media’s escalation of the Venezuelan crisis and their complete silence when it comes to Haiti, raises some important questions about the United States’ inconsistency in upholding the values of human rights and democracy. 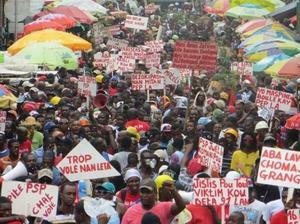 Haiti has been enduring a political crisis since the highly controversial election of President Michel Martelly, who received his mandate from only 16.7 percent of registered voters, and has been running the country without a fully functioning government in order to avoid dealing with constitutionally mandated checks and balances. For the third year in a row, Martelly has promised to hold elections to fill legislative and local seats without yet following through. As evidence of Martelly’s unbridled commitment to democracy, instead of holding elections for mayors whose terms expired in 2012, he personally handpicked the representatives, appointing them as “municipal agents.” As a result of Martelly’s political inaction on the national level, one third of the seats in the Haitian Senate remain empty. This congressional inability to establish quorum on issues of national importance has been particularly convenient for the President. In September 2013, the Senate put forward a resolution to indict President Martelly, Prime Minister Laurent Lamothe, and the Minister of Justice Jean Renel Sanon for high treason, lying to the public, and playing a harmful role in the death of Judge Jean Serge Joseph. Earlier in 2013, Judge Joseph had been given the task of overseeing a high profile corruption investigation against President Michel Martelly’s wife Sophia and their son Olivier. Judge Joseph had reported receiving threats to dismiss the corruption case during a meeting with Martelly, the Prime Minister, and the Minister of Justice and Public Security. Joseph refused, and two days later he died under suspicious circumstances. Because the Haitian Senate has only 16 of 30 members currently active, the impeachment vote was not passed on a technicality. This was in spite of the decision, which saw 7 of the 16 members vote in favor of Martelly’s impeachment, with 9 abstentions and 0 voting against the motion. According to the Haitian Constitution, abstentions do not count as votes—with Article 117 stating that “All acts of the Legislature must be approved by a majority of the members present [emphasis added].” Thus, in regular circumstances the decision by the Senate would move forward with the impeachment. Therefore, this purposefully fragmented political system does a great deal to serve the interests of impunity. A civil engineer by training, Dorsainvil had been a tireless advocate for justice, routinely speaking out against the Martelly government for its disregard of human rights, political scandals, and the consistent delaying of elections. Dorsainvil’s latest initiative was the establishment of the Patriotic People's Democratic Movement (MPDP), a group of thirty political and social organizations openly standing in opposition to Martelly’s government. While this attack is tragic on its own, it comes after numerous threats against Haitian human rights defenders such as Patrice Florvilus, Mario Joseph, and André Michel. The targeting of Patrice Florvilus and other attorneys demonstrates a troubling pattern of state obstruction of legitimate human rights work in Haiti…The government’s use of state institutions such as law enforcement, and its failure to address judicial and extra-legal threats leave human rights defenders dangerously exposed. All sectors of the government, from the police to the courts, are responsible for safeguarding human rights. Due to the neglect and failure of the Haitian government to protect Florvilus and his family from attacks, he has had to relocate to Montreal in December 2013. In October 2013, human rights lawyer Andre Michel was arrested by the Haitian National Police due to his initiation of legal proceedings against Martelly’s wife and son related to charges of corruption, which Judge Joseph oversaw before his death. Haitian human rights organizations condemned the arrest as an arbitrary and politically motivated attempt to intimidate human rights activists and members of the opposition. Thus, while Martelly was praised by President Obama in early February for his leadership, Haiti has also seen a slew of anti-government protests due to the political crisis, human rights abuses, and economic decline. The lack of media attention regarding Martelly’s consistent attacks on popular organizations and human rights defenders in Haiti, in contrast to Venezuela is a stark reminder of how abuses of power can be marginalized if one has influential friends in the right places. The media bias facing Venezuela—be it due to Venezuela’s fervent anti-U.S. policy and rhetoric, or the fact that it sits on the largest oil reserves in the hemisphere—allows the United States to shape public perception toward the country on its own strategic terms. In the absence of this insistence on sovereignty, human rights abuses and the suspension of political liberties can continue indefinitely in Haiti—as long as the government is set on accommodating the interests of the United States instead of challenging them.